Spin art is a lot of fun for little hands, it's also a very tactile, kinetic activity great for kids with special needs as well. My trick to quick, easy spin art is a salad spinner. I picked one up from the store and I've put it to great use in the art classroom ever since. These heroes are totally vibrant and mysterious all at the same time. 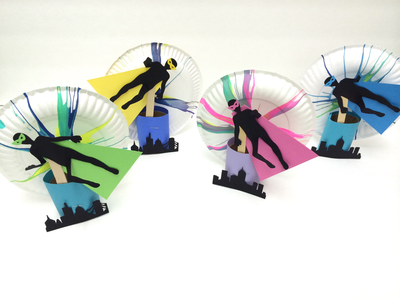 Create these fun heroes complete with capes, masks, exploding backgrounds and cityscapes below. Step 1. Place a small white paper plate into the salad spinner, apply your paint and start spinning, this is so much fun. When you're happy remove and let dry. Step 2. For the superheroes I cut out the body, mask and cityscape on my Cricut, but you can use superhero embellishments found at the craft store and have the kids cut out their own shapes. 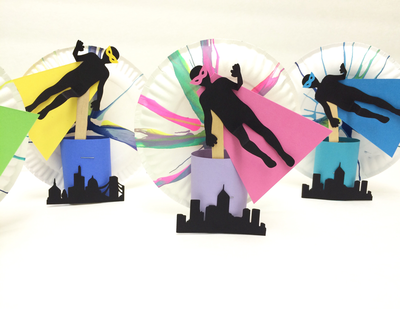 Assemble your hero and glue to a popsicle stick. Step 3. Cut a toilet tube in half and staple your hero on the stick to the inside of the tube then cover with a piece of cardstock paper. Apply your city scape and any other details. Step 4. Staple the plate to the tube behind the hero.